Justin Beardsell (meno) of Studio Meno is collaborating with Dolby to bring a new clubbing experience to Ministry of Sound in London — and he's using Vuo behind the scenes. Ministry of Sound has introduced a Dolby Atmos sound system that creates 3D soundscapes. Unlike with typical stereo tracks, listeners hear the music moving through space, coming from different sides and overhead. Justin has added a visual component to the 3D audio system. He controls an LED lighting rig in the ceiling that lights up to visualize the sounds moving through space. "I feel that the addition of a visual element directly responding to the Atmos audio helps reinforce the relationship between the Atmos audio and the 3D space that it is in," said Justin in an email interview. "It’s the icing on the cake, really, and adds another sensory element to help the audience identify the various 3D elements of the music. Some of the best reactions have been from the DJs themselves." When asked how he'd introduce himself to the Vuo community, Justin said, "I have been a VJ for about 10 years, and now run my creative company Studio Meno which makes visual installations mostly for live music events using various media." 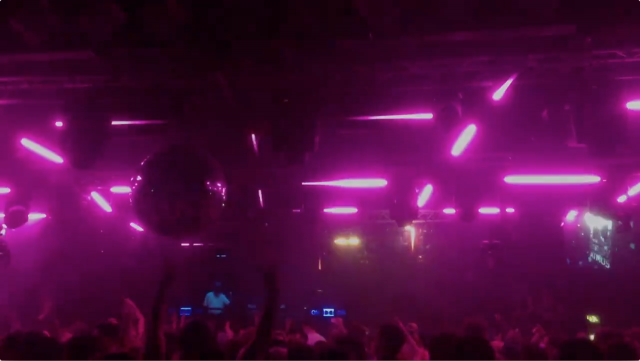 In Justin's setup at Ministry of Sound, Vuo serves as a bridge between Dolby Atmos, which sends information about the "audio objects" moving through 3D space, and VDMX + Quartz Composer, which makes the visuals. He commented, "I tried a number of ways to get this to work and so far this method using Vuo is the best." The Atmos system works by having up to 22 audio stems (i.e., 11 stereo pairs) playing concurrently on each DJ deck as well as the main stereo body of the track. They program these in advance (and also have a joystick to control them live) to move around the room in a virtual 3D space, which is then interpreted by their system which adjusts levels for each speaker in that 3D space accordingly. Meanwhile, for my part to work, their software is also outputting OSC data for each audio stem with position data, level data, and the size of the audio object in its 3D space. I can see their screen, which shows me which audio aspects are moving around the 3D space. I pick one to follow (by pressing the corresponding button on my MIDI controller) and Vuo filters out all the other OSC data, leaving me with just the data for the object I want to follow, and sends this to VDMX which is running a Quartz Composer patch with a little visualisation. The visualisation is sent to an overhead grid of pixel strips over the crowd, so that there is LED lighting overhead which at all times corresponds to one or more of the Atmos audio objects being played, both in terms of its location in the room and intensity (which is directly linked to the level of the audio stem it is following). In addition to using Vuo to route OSC from Dolby Atmos to visuals software, Justin has also made some visuals for Ministry of Sound with Vuo. "I have an audio-reactive patch running with the Dolby logo which is displayed on the projectors around the club to indicate when a true Atmos track is being played." "It is an ongoing project with Dolby," said Justin. "We have been working together on testing all aspects of the system and make changes each time to improve the setup for each show." The next Dolby Atmos show is on September 24 and features Steve Lawler. For more info and videos, visit Studio Meno's project pages on Atmos 3D Lighting and Audio Reactive Visuals. This is incredible work. Thank you for sharing the story and the setup. Showcase your work and get a free credit! Plus — Vuo in a live performance!